We love Everlane product, not so much the crowds in the store. Check out the full review below. Here’s the thing about Everlane: the product is great. It really is. But here’s the other thing: you can buy that incredible product online. I have been an Everlane mock-neck cropped turtleneck enthusiast since before an Everlane brick and mortar presence was even an idea on the horizon. All that is just to say that if you are already familiar with the brand, you probably dont need to go to the store to learn about the product. You already know; you are probably wearing Everlane as you read this. If you aren’t already familiar with the product, the store could be a good place to try it on. A word of caution though: you will have to wait in some long lines to get a dressing room. The store is always crowded and honestly you may be better off just going online and ordering the same pieces to your home. The people at Everlane mainly stand out as walking billboards of the brand. They are dressed in the millennial uniform of white t-shirt or solid colored sweater, wide leg jeans and either sneakers or booties. The effect is successful in having the staff both blend into the general store aesthetic and provide IRL outfit inspiration for the customers. The store itself is designed in the same aesthetic as the clothes - bright, light and minimal. The problem is though, that it is always packed. When you have a minimal space, stuffed to the gills with people and have lines that stretch the length of the store, you no longer feel as though you are in a minimalist space. Instead you feel crowded and constrained. To be fair, the lines move quickly because the store is cashless and there are a lot of dressing rooms to move people along. Yet the feeling of being crowded remains. I am already an Everlane sweater devotee. No store experience is going to change that. 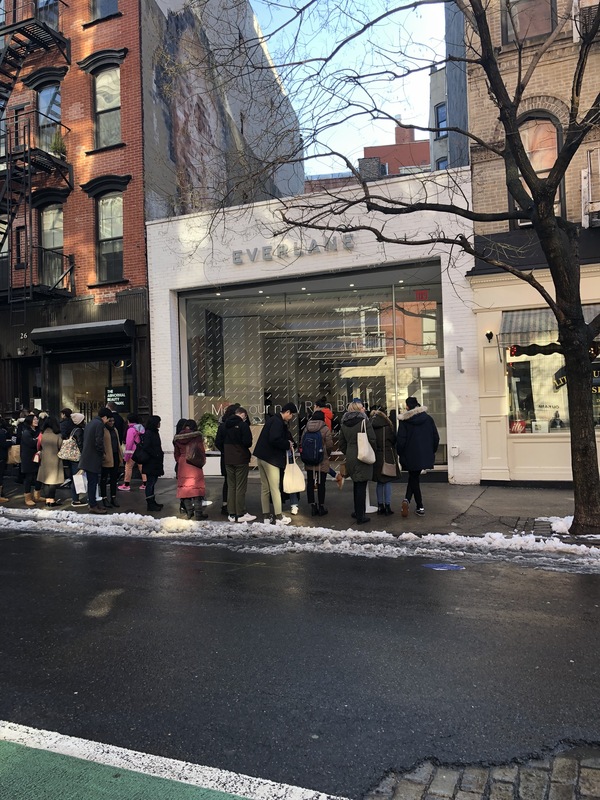 However, unless Everlane opens more stores in NYC (which would hopefully cut down the crowds), I dont think I will be going back to shop in person any time soon.